Frustrating political divisions have drowned out the 10th anniversary of what many have called the most unloved equity bull market in history. Broad based equity market investors (those who held their nerve) have enjoyed annualised returns of over 10% since that frightful March 2009. This is quite extraordinary given the low investor confidence and general lack of exuberance this bull run was characterised by. It must have felt just as extraordinary for the big winners of the previous decade – hedge fund investors. To their surprise, plain, vanilla, low cost investments of diversified equity funds generated superior returns, despite being generally accessible for the ‘average Joe’ and not coming with excessive fees. The past 12 months have proven once again that this long-lasting cycle is somewhat different to previous investor experiences. The comparatively slow but consistent rate of global economic expansion over the past decade, that has been accompanied by very low interest rates and yields, has been particularly profitable for businesses, but less so for their employees. This unusual environment has not been conducive for the rise of exuberant confidence that in the past led to the relatively shorter cycles of boom and bust. Instead, due to the fragile confidence levels, even smaller economic slowdowns have led to excessive declines in short term investor confidence. The ensuing rapid declines in risk asset valuations appeared to be purgatory. And through the parallel fall in the cost of loan capital and other input price, they laid the base for the next upswing in economic activity, corporate profits and stock market valuations. This pattern appears to be applicable to the past 12 months as well. Corporate credit has become cheaper again, central banks and select governments have provided stimulus measures for the economy and the fear of losing wealth has once again turned into fear of losing out. So, capital markets have staged another extraordinary recovery rally as our asset returns table documents. As we wrote last week, history rhymes but does not necessarily repeat. But it is interesting to note that more and more market commentators are suggesting that various feeble signs of not-so-bad economic data are actually the green shoots of the next mini upswing in this drawn out cycle. We do not disagree, but have stated here before that the longer this cycle lasts the higher the nervousness that the end is near and the more pronounced the sell-off episodes become. For the coming months, however, there are many indications that the economy and markets are likely to follow a similar path to the various previous episodes and trade in calmer and more positive terms than what we experienced over 2018. Politics may appear to pose a significant risk to this benign scenario, particularly from a UK perspective. But there were signs over the past week that the bigger political issue – the trade war between the USA and China – is slowly but steadily drifting towards a resolution. 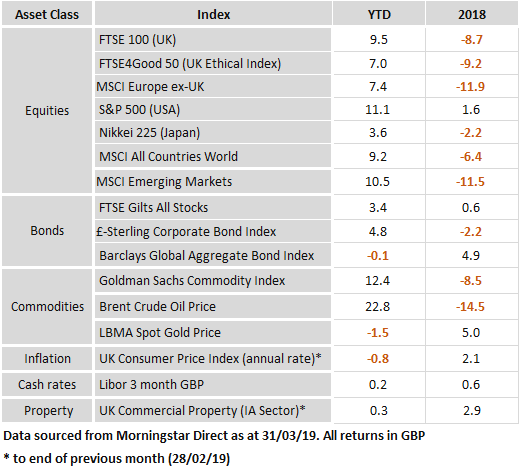 Consequently, stock markets around the world closed the week higher on the improved trading prospects and continued to more or less ignore the UK’s Brexit impasse. This is most probably because there is a firm belief that politicians between the UK and the remaining EU will prevent a disorderly Brexit scenario even if we seem precariously close to the precipice. As we have suggested before, a longer than envisaged extension to the actual leaving date seems the most probable course of action, as is a softer form of Brexit which preserves the membership in the Common Market but exits the political framework – at least for the time being. There is still much work needed to get there, but there were signs that both sides appear to have the will to do so, rather than letting the more radical operators take control.